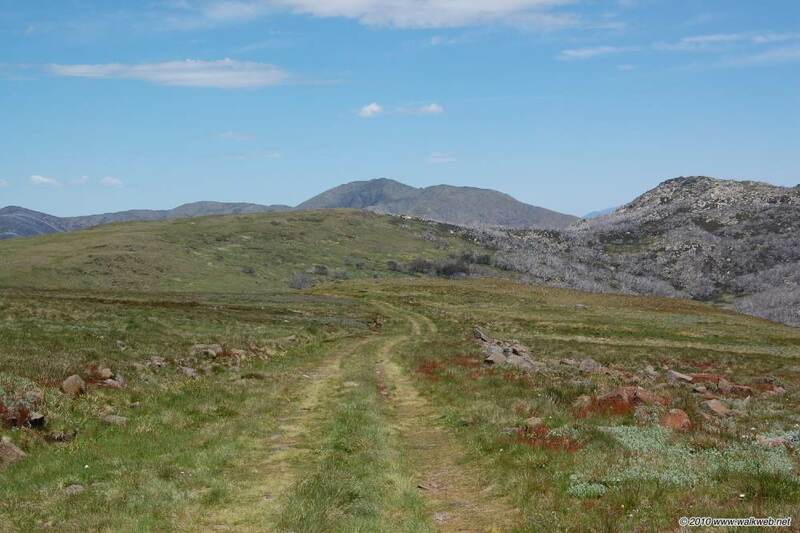 This walk is a pleasant circular route in the Bogong High Plains around Falls Creek Ski Resort, commencing at the attractive Pretty Valley Pondage, a small man-made reservoir. The track starts at the causeway over Pretty Valley Pondage – cross over and follow Fainter Fire track as it climbs to the east. After attaining the high point on the ridge, there are good views towards the Jaithmathangs (formerly the Niggerheads), Mt Fainter and Mt Feathertop across the valley. The fire trail eventually reaches a pole line and a sign-posted junction. The suggested route leaves the fire trail here and turns left (south-east) to follow the pole line (nb: Tawonga Huts, reached by following the fire trail right to the north would make a nice side trip). The pole line climbs steadily for a while then descends to a junction of three pole lines, including the Alpine Walking Track route. At this point, a short side trip to Mt Jim is recommended which can be seen to the south. Mt Jim has trees around its base, but there is a clear view from the top. After stopping to take in the view, leave the summit and rejoin the pole line. Keep following it, now identified with Alpine Walking track diamond shaped markers, as it passes to the north of Mt Bundara and ultimately joins another fire track at Cope Saddle Hut (hard to miss with a fluorescent red roof). From here, follow the fire trail northwards, accompanied for the most part by a pole line, back to Pretty Valley. Access: Pretty Valley Pondage is accessed via Falls Creek. Follow the main road towards Rocky Valley Storage, there is a sign-posted turnoff to the right. The road is gravel but 2WD vehicles should be fine in dry weather.